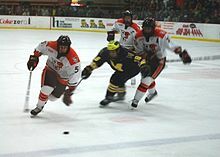 The National Collegiate Athletic Association has conducted national championships for men's ice hockey since 1948, and women's ice hockey since 2001. U.S. college hockey players must be deemed eligible for NCAA competition by the NCAA Eligibility Center, a process that examines a student-athlete's academic qualifications and amateur status. Players who have participated in the Canadian Hockey League or any professional hockey league are considered ineligible. Men's U.S. college hockey is a feeder system to the National Hockey League. As of the 2010–11 season, 30 percent of NHL players (a total of 294) had U.S. college hockey experience prior to turning professional, an increase of 35 percent from the previous 10 years. That percentage has been maintained the past three seasons, with a record 301 NHL players coming from college hockey in 2011–12. One hundred thirty-eight colleges and universities sponsor men's ice hockey in the NCAA's three divisions. The NCAA Division I has 60 ice hockey teams as of the 2015–16 season. Twenty-one schools are Division II or III athletic programs that "play up" to Division I in hockey, and 16 schools that are full Division I members are in the Football Bowl Subdivision, six of which compete in the Big Ten Conference. The NCAA Division I Championship is a 16-team, single-elimination tournament, divided into four, 4-team regional tournaments. The winner of each regional advances to the Frozen Four to compete for the national championship. For many years, 5 teams earned automatic bids through winning conference tournament championships, while 11 earned at-large berths through a selection committee. With the addition of the Big Ten Hockey Conference for the 2013–14 season, the tournament now features 6 automatic qualifiers, and 10 at-large bids. The ranking system that is used to determine the at-large teams is known as the Pairwise Rankings, which uses a number of ranking factors to create a scoring system for all NCAA Division I teams. The Ivy League recognizes ice hockey champions for both sexes, but it does not sponsor the sport; it instead uses the results of regular-season ECAC Hockey matches involving two Ivy League schools to extrapolate an Ivy champion (all six Ivy League schools that sponsor varsity hockey do so for both men and women, and compete in the ECAC). The Metro Atlantic Athletic Conference sponsored D-I men's hockey, but dropped the sport in 2003. The Hobey Baker Memorial Award honors the top player in men's Division I hockey. The Mike Richter Award honors the top goaltender in Division I. The NCAA does not currently sponsor a championship in Division II, as there is only one conference that currently sponsors hockey, the Northeast-10 Conference. The NCAA conducted a Division II national championship from 1978 to 1984 and also from 1993 to 1999. The NCAA has conducted a Division III national championship since 1984. The current championship format is a 12-team (formerly 11-team), single-elimination bracket. Eighty-eight colleges and universities sponsor women's ice hockey in two divisions: National Collegiate and Division III. The National Collegiate championship is an 8-team, single-elimination tournament to determine the national champion. The Patty Kazmaier Memorial Award is awarded annually by USA Hockey to the top player in women's Division I hockey. The most recent school to add varsity women's hockey was Merrimack, which upgraded its women's club team to full varsity status for the 2015–16 season and joined the school's men's team in Hockey East. The Division III championship is a 9-team, single-elimination tournament to determine the national champion. Windsor Lancers and Western Mustangs during 2013 CIS (now U Sports) playoffs. University hockey teams in Canada compete in leagues as part of U Sports, the national governing body for Canadian university athletics (in Canadian English, the term "college" is reserved for schools that would be called "junior", "community", or "technical" colleges in the U.S.). U Sports sponsors both men's and women's hockey. Like in the United States, teams compete in athletic conferences based on geographical locations of the schools. Unlike the NCAA, U Sports does not award players with athletic scholarships, resulting in a lack of divisional separation such as found between NCAA divisions. Individual conferences hold postseason tournaments, followed by the round-robin U Sports championship tournament in late March. In 2015, a group of member schools in the National Association of Intercollegiate Athletics (NAIA) began working to add the sport to the organization. The NAIA originally sponsored a men's ice hockey championship from 1968 to 1984 when it was discontinued due to many of the schools with teams leaving the NAIA for the NCAA. A few NAIA schools continued to sponsor the sport as varsity-club teams in the ACHA. A growing number of schools have added ice hockey as members of the ACHA over the past 5–10 years. In 2016, several NAIA institutions that sponsor men's ice hockey teams announced the formation of a coaches association and a new division for NAIA ice hockey program to begin play during the 2017-18 season. In 2017, The Wolverine-Hoosier Athletic Conference (WHAC) became the first current conference in the NAIA to offer the sport and host a conference championship. The American Collegiate Hockey Association (ACHA) is the sanctioning body for non-NCAA, club ice hockey in the United States. The organization provides structure, regulations and promotes the quality of collegiate ice hockey. Teams separated into three men's and two women's divisions with over 300 teams from across the United States. The recruiting process, rules and regulations, and player eligibility standards parallel that of NCAA division 3. Sometimes, ACHA and NCAA will play games against each other to complete each of their season schedules. The Big Chill at the Big House – December 11, 2010 held at Michigan Stadium set the hockey attendance record when 104,173 fans watched Michigan defeat Michigan State, 5–0. Frozen Diamond Classic – January 15, 2012, Michigan defeated Ohio State University, 4–1, at Progressive Field in Cleveland, OH. North Dakota and Omaha played in an outdoor game at TD Ameritrade Park in Omaha, Nebraska on February 9, 2013, with North Dakota winning, 5–2. 2013 Great Lakes Invitational – December 27–28, 2013 - The annual Detroit-based holiday tournament was moved outdoors from its traditional location at Joe Louis Arena to Comerica Park. The field consisted of Michigan, Michigan State, Michigan Tech and Western Michigan. Bowling Green State University hosted Robert Morris University in an outdoor game at Fifth Third Park in Toledo, Ohio, on January 3, 2015. The game ended in a 2-2 draw. The Battle on Blake – February 20, 2016, University of Denver Pioneers vs. Colorado College Tigers as part of the Battle for the Gold Pan at Coors Field. Robert Morris hosted Niagara in an outdoor game at Heinz Field in Pittsburgh, Pennsylvania, on February 26, 2017. The Colonials won the game 5-1. Admission was free of charge. A rivalry between the United States Military Academy (Army) Black Knights and the Royal Military College of Canada (RMC) Paladins resulted in an annual West Point Weekend hockey game. The series was first played in 1923, and was claimed to be the longest-running annual international sporting event in the world. Army and RMC played continuously from 1949 until 2007, when scheduling conflicts forced the academies to abandon the scheduled game. The series will resume in 2011–12 and continue for the next two seasons at least. In Europe the first college hockey league called EUHL was founded in 2013. In the United Kingdom, college hockey league is operated by BUIHA (British Universities Ice Hockey Association). It was founded in 2003 and currently includes 23 clubs across the UK. ^ "NCAA College Hockey vs. CHL Major Junior". College Hockey inc. NCAA. January 9, 2015. ^ "College Hockey Inc. - Your NCAA Hockey Resource". collegehockeyinc.com. ^ "National Association of Intercollegiate Athletics Ice Hockey". NAIA. August 2015. Retrieved December 10, 2015. ^ "ICE HOCKEY – POTENTIAL FOR RETURN TO NAIA" (PDF). NAIA-ADA. September 2015. Retrieved December 10, 2015. ^ Patterson, Jared (January 16, 2017). "Waldorf to play NAIA hockey in 2017-18". Mason City Globe Gazette. Retrieved July 21, 2017. ^ "WHAC adds hockey and Tech gets tourney". The Journal Gazette. July 5, 2017. Retrieved July 21, 2017. ^ "This club is ultra-competitive". NHL.com. ^ "Record crowd watches hockey game". ESPN.com. Associated Press. December 12, 2010. Retrieved December 13, 2010. ^ "Maine hockey team to play its second Frozen Fenway game in January 2014". bangordailynews.com. ^ a b "University of Minnesota announces outdoor Hockey City Classic". startribune.com. ^ Nick Groke, "Denver, Colorado College prep for Coors Field hockey with first look," Denver Post, February 19, 2016. ^ "Army-RMC Rivalry". Go Army Sports.com. Archived from the original on May 3, 2011. Retrieved January 1, 2009. ^ Crowly, R, and Guinzburg, T: "West Point: Two Centuries of Honor and Tradition" (ISBN 0-446-53018-2), page 234. Warner Books, 2002. ^ "College Hockey's Top 10 Rivalries". collegehockeynews.com. ^ Evolution, Heureka (November 4, 2013). "Hokej: Štartuje univerzitná liga, má ambíciu rozšíriť sa po celej Európe - Hlavné správy". hlavnespravy.sk.